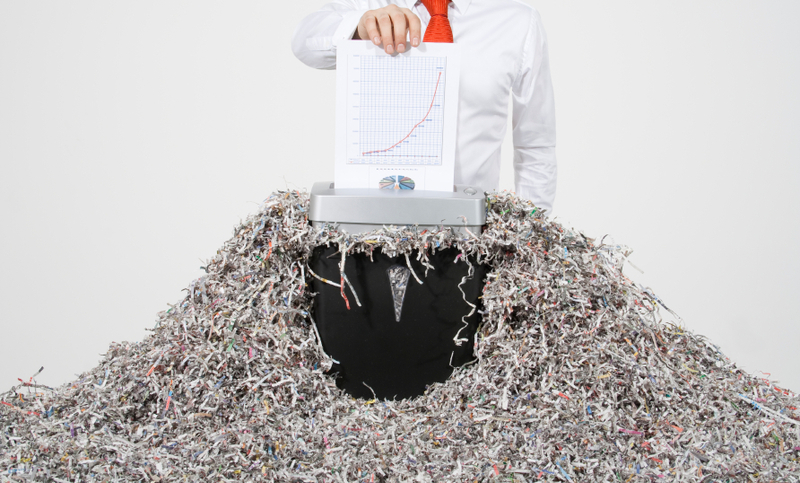 Shredding piles upon piles of documents for your business isn’t only time consuming. There are a lot of inherent risks involved with letting your ‘to be shredded’ pile build up. One of the biggest mistakes that could happen is the accidental shredding of documents that need to be retained, or weren’t supposed to be shredded at all. Let’s face it- stuff happens. When you have a task that might not have been attended to for weeks (or longer), there’s bound to be a few documents that were misplaced with irrelevant or older files. An employee could also make a mistake by not understanding your document management plan and mis-mark files to be destroyed. The one common thread in this is that although there is a greater risk of these kind of mistakes when you shred your documents internally, if you don’t have a way to manage your documents and workflow efficiently, you might have something critical destroyed that could ruin your business- or worse. One example that highlights this tremendously sensitive problem is the document destruction issue that happened in the Department of Veteran’s Affairs Offices across the country in 2008. An investigation found that 489 documents that included benefits claims and supporting documents were found among piles of papers set aside for destruction. Claims often include personal records supplied by veterans that are not duplicated in government files and might be difficult to replace, such as certificates for births, deaths and marriage. Although some of these documents were placed in this pile by mistake, there was also evidence that some employees were deliberately put documents in a shredding bin. These types of issues can be significantly minimized by ensuring all employees understand your document management plan and the appropriate document retention schedule. You can also consider digitizing your documents to eliminate your paper files altogether. Click here to read more about this series of articles from the Tampa Bay Times, along with the interpretation of the repercussions of this issue for veterans. Let us help you minimize the risk of accidentally shredding important documents. Shred Nations provides secure document shredding services through a network of providers in locations nationwide. Our providers offer comprehensive quotes within minutes for your document shredding and recycling project so that you don’t have piles of documents set aside for shredding every month. Fill out the form on the right or give us a call at (800) 747-3365 to get free quotes today!